The UK Government's Spending Review gives cold comfort to many Europe-based British pensioners. Two contrasting experiences in dealing with utility problems gives Dave food for a bit of thought. Maggie – to mourn or to mock? Britain's longest-serving Prime Minister of the 20th century appears to be dividing the country as much in death as she did in life. It’s all Greek to them! – out now! 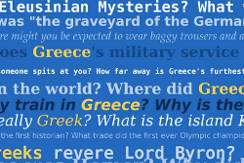 Our latest eBook for Kindle is out now - It's all Greek to them! 101 amazing facts about Greece and the Greeks by Theodore Koukouvitis. Download our latest eBook - all about the murky world of the 'make money online' industry. Free through the Kindle Store until 0800 GMT on Sunday 18 November!